Chives, scientific name Allium schoenoprasum, are an edible species of the genus Allium. Their close relatives include the garlic, shallot, leek, scallion, and Chinese onion. A. schoenoprasum is the only species of Allium native to both the New and the Old Worlds. Chives are a bulb-forming herbaceous perennial plant, growing to 30–50 cm (12–20 in) tall. The bulbs are slender, conical, 2–3 cm (3⁄4–1 1⁄4 in) long and 1 cm (1⁄2 in) broad, and grow in dense clusters from the roots. The scapes (or stems) are hollow and tubular, up to 50 cm (20 in) long and 2–3 mm (1⁄16–1⁄8 in) across, with a soft texture, although, prior to the emergence of a flower, they may appear stiffer than usual. 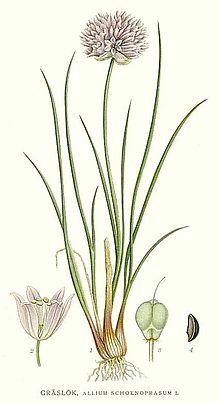 The grass-like leaves, which are shorter than the scapes, are also hollow and tubular, or terete, (round in cross-section) which distinguishes it at a glance from garlic chives (Allium tuberosum). The flowers are pale purple, and star-shaped with six petals, 1–2 cm (1⁄2–3⁄4 in) wide, and produced in a dense inflorescence of 10-30 together; before opening, the inflorescence is surrounded by a papery bract. 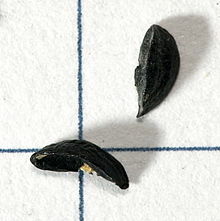 The seeds are produced in a small, three-valved capsule, maturing in summer. The herb flowers from April to May in the southern parts of its habitat zones and in June in the northern parts. It was formally described by the Swedish botanist Carl Linnaeus in his seminal publication Species Plantarum in 1753, on page 301. The name of the species derives from the Greek σχοίνος, skhoínos (sedge or rush) and πράσον, práson (leek). Its English name, chives, derives from the French word cive, from cepa, the Latin word for onion. In the Middle Ages, it was known as 'rush leek'. It has two known subspecies; Allium schoenoprasum subsp. gredense (Rivas Goday) Rivas Mart., Fern.Gonz. & Sánchez Mata and Allium schoenoprasum subsp. latiorifolium (Pau) Rivas Mart., Fern.Gonz. & Sánchez Mata. Chives are native to temperate areas of Europe, Asia and North America. It is found in Asia within the Caucasus (in Armenia, Azerbaijan and Georgia), also in China, Iran, Iraq, Japan (within the provinces of Hokkaido and Honshu), Kazakhstan, Kyrgyzstan, Mongolia, Pakistan, Russian Federation (within the provinces of Kamchatka, Khabarovsk, and Primorye) Siberia and Turkey. In middle Europe, it is found within Austria, the Czech Republic, Germany, the Netherlands, Poland and Switzerland. In northern Europe, in Denmark, Finland, Norway, Sweden and the United Kingdom. In southeastern Europe, within Bulgaria, Greece, Italy and Romania. It is also found in southwestern Europe, in France, Portugal and Spain. In Northern America, it is found in Canada (within the provinces of Alberta, British Columbia, Nova Scotia, New Brunswick, Newfoundland, Nunavut, Ontario, Prince Edward Island, Quebec, Saskatchewan and Yukon ), in the United States (with the states of Alaska, Colorado, Connecticut, Idaho, Maine, Maryland, Massachusetts, Michigan, Minnesota, Montana, New Hampshire, New Jersey, New York, Ohio, Oregon, Pennsylvania, Rhode Island, Vermont, Washington, West Virginia, Wisconsin and Wyoming). Chives are grown for their scapes and leaves, which are used for culinary purposes as a flavoring herb, and provide a somewhat milder flavor than those of other Allium species. Chives have a wide variety of culinary uses, such as in traditional dishes in France, Sweden, and elsewhere. In his 1806 book Attempt at a Flora (Försök til en flora), Retzius describes how chives are used with pancakes, soups, fish, and sandwiches. They are also an ingredient of the gräddfil sauce with the traditional herring dish served at Swedish midsummer celebrations. The flowers may also be used to garnish dishes. In Poland and Germany, chives are served with quark cheese. Chives are one of the fines herbes of French cuisine, the others being tarragon, chervil and parsley. Chives can be found fresh at most markets year-round, making them readily available; they can also be dry-frozen without much impairment to the taste, giving home growers the opportunity to store large quantities harvested from their own gardens. Retzius also describes how farmers would plant chives between the rocks making up the borders of their flowerbeds, to keep the plants free from pests (such as Japanese beetles). The growing plant repels unwanted insect life, and the juice of the leaves can be used for the same purpose, as well as fighting fungal infections, mildew, and scab. Chives are also rich in vitamins A and C, contain organosulfur compounds, and are rich in calcium and iron. Chives thrive in well-drained soil, rich in organic matter, with a pH of 6-7 and full sun. They can be grown from seed and mature in summer, or early the following spring. 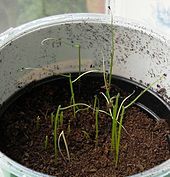 Typically, chives need to be germinated at a temperature of 15 to 20 °C (60-70 °F) and kept moist. They can also be planted under a cloche or germinated indoors in cooler climates, then planted out later. After at least four weeks, the young shoots should be ready to be planted out. They are also easily propagated by division. Chives are susceptible to damage by leek moth larvae, which bore into the leaves or bulbs of the plant. It was mentioned in 80 A.D. by Marcus Valerius Martialis in his "Epigrams". He who bears chives on his breathe, Is safe from being kissed to death. The Romans believed chives could relieve the pain from sunburn or a sore throat. They believed eating chives could increase blood pressure and act as a diuretic. 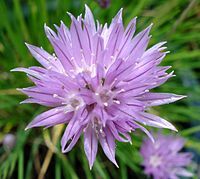 Romani have used chives in fortune telling. Bunches of dried chives hung around a house were believed to ward off disease and evil. In the 19th century, Dutch farmers fed cattle on the herb to give a different taste to milk. ^ a b c "Allium schoenoprasum L. is an accepted name". 23 March 2012. theplantlist.org. Retrieved 19 November 2017. ^ LaFray, Joyce (1987). Tropic Cooking: The New Cuisine from Florida and the Islands of the Caribbean. Oakland: Ten Speed Press. p. 292. ISBN 0-89815-234-8. ^ a b Block, E. (2010). Garlic and Other Alliums: The Lore and the Science. Royal Society of Chemistry. ISBN 0-85404-190-7. ^ "Allium schoenoprasum in Flora of China @ efloras.org". www.efloras.org. Retrieved 2017-06-18. ^ Tardiff, B.; Morisset, P. (1990). "Clinal morphological variation of Allium schoenoprasum in eastern North America". Taxon. 39 (3): 417–429. JSTOR 1223088. ^ "Allium schoenoprasum in Flora of North America @ efloras.org". www.efloras.org. Retrieved 2017-06-18. ^ Altervista Flora Italiana, Erba cipollina, wild chives, Civette, Schnittlauch, Allium schoenoprasum L. includes photos, drawings, European distribution map, etc. ^ a b "Allium schoenoprasum - Plant Finder". mobot.org. ^ a b c d Linford, Jenny (2010). A concise guide to herbs. Bath: Parragon. p. 45. ISBN 9781405487993. ^ Kaufman, Peter B; Thomas J Carlson; Kaufman B Kaufman; Harry L Brielmann; Sara Warber; Leland J Cseke; James A Duke (1999). Natural Products from Plants. Boca Raton: CRC Press. p. 261. 084933134X. ^ Gräslök, from Den virtuella floran, retrieved on June 13, 2006, The facts mentioned on the site apply to Sweden, which is in the northern part of the habitat zone. ^ McGary, Mary Jane (2001). Bulbs of North America: North American Rock Garden Society. Portland: Timber Press. pp. 28–29. 088192511X. ^ "Alliaceae Allium schoenoprasum L." ipni.org. Retrieved 19 November 2017. ^ Anna-Lena Anderberg. 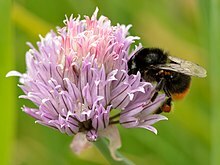 "Den virtuella floran: Allium schoenoprasum L. - Gräslök". nrm.se. ^ a b c Peggy Trowbridge Filippone. "Chive Selection and Storage". About.com Food. ^ a b c d "Taxon: Allium schoenoprasum L." ars-grin.gov. Retrieved 19 November 2017. ^ Andy Hamilton. "pests – selfsufficientish – pests". selfsufficientish.com. ^ Gualtiero Simonetti (1990). Stanley Schuler (ed.). Simon & Schuster's Guide to Herbs and Spices. Simon & Schuster, Inc. ISBN 0-671-73489-X. ^ Fukaya, M; et al. (2019). "Cyclic Sulfur Metabolites from Allium schoenoprasum var. foliosum". Phytochemistry Letters. 29: 125–128. doi:10.1016/j.phytol.2018.11.018. ^ Durand, Faith (23 May 2008). 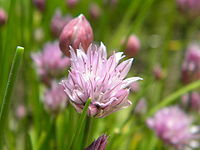 "Tip: How to Use Chive Blossoms in Salads and Other Dishes". thekitchn.com. Retrieved 24 May 2017. ^ a b c McGee, Rose Marie Nichols; Stuckey, Maggie (2002). The Bountiful Container. Workman Publishing. ^ Landry, Jean-François (June 2007). "Taxonomic review of the leek moth genus Acrolepiopsis (Lepidoptera: Acrolepiidae) in North America". The Canadian Entomologist. 139 (3): 319–353. doi:10.4039/n06-098. ISSN 1918-3240. ^ Staub, Jack E. (2008). 75 Exceptional Herbs for Your Garden. Gibbs Smith. p. 54. ISBN 978-1-4236-0251-4. "Chive" . Encyclopædia Britannica. 6 (11th ed.). 1911. p. 253.